Public Health Ontario (PHO) developed Clostridium difficile infection (CDI) case scenarios to address frequently asked questions about CDI cases and outbreaks in hospitals. Each scenario provides an opportunity for learners to enhance their understanding of CDI surveillance and outbreak management and apply knowledge to complex CDI situations in daily practice. Click here for links to resources for members. The lists of CMLTO-approved refresher courses for MLTs have been updated for 2018. Click here for further information. The CMLTO Discipline Committee held a hearing on December 21, 2017, at Victory Verbatim, 222 Bay Street, in Toronto to consider allegations of professional misconduct against member Mahmood Khan, whose principal place of practice is LifeLabs in Mississauga. Click here for Hearing summary details (PDF). Looking for a speaker in 2018? All MLTs in Ontario were notified of the CMLTO’s 2018 Annual Registration Renewal requirements by letter mail in October 2017, and the online renewal platform became available on November 1, 2017. The opportunity to renew the CMLTO membership without penalty ended December 31, 2017. Members who failed to renew by the deadline will receive a Notice of Intention to Suspend from the Registrar & CEO in the coming week. 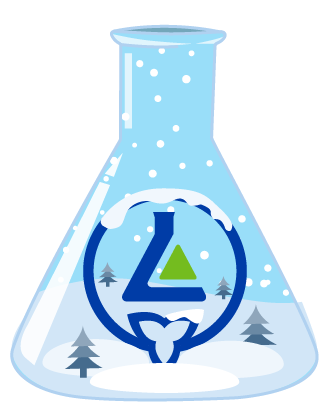 Members wishing to renew their membership can still do so, with late fees, up to and including Tuesday, February 6, 2018, at www.cmlto-onlineservices.com, however, late fees have now been added to renewal fees. All MLTs who have not renewed their membership by Tuesday, February 6, 2018, will have their certificate of registration suspended. If a member’s certificate of registration is suspended, the Registrar & CEO will notify the member and their employers by mail. 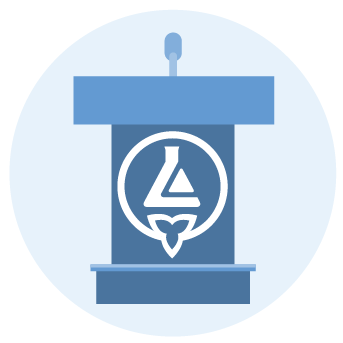 Upon suspension, the certificate of registration expires, and the former member is no longer authorized to practise medical laboratory technology in Ontario. 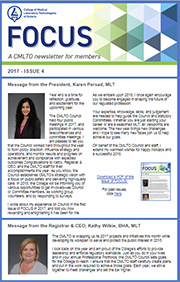 The most recent issue of the CMLTO member newsletter is now available. Read the current issue online here and back issues here. Regular office hours resume at 8:30 am on January 2, 2018. 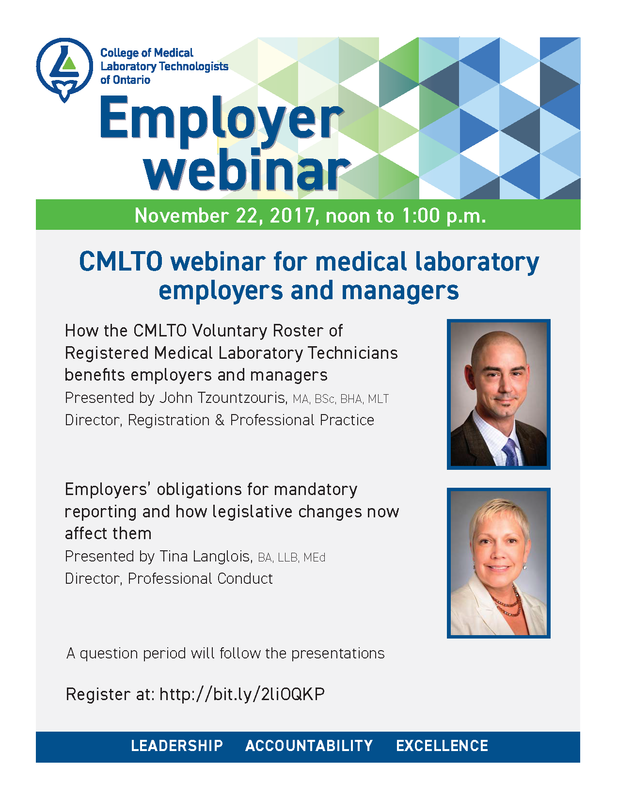 Click here to watch the CMLTO webinar presentation video (MP4) for medical laboratory employers and managers held in November 2017. 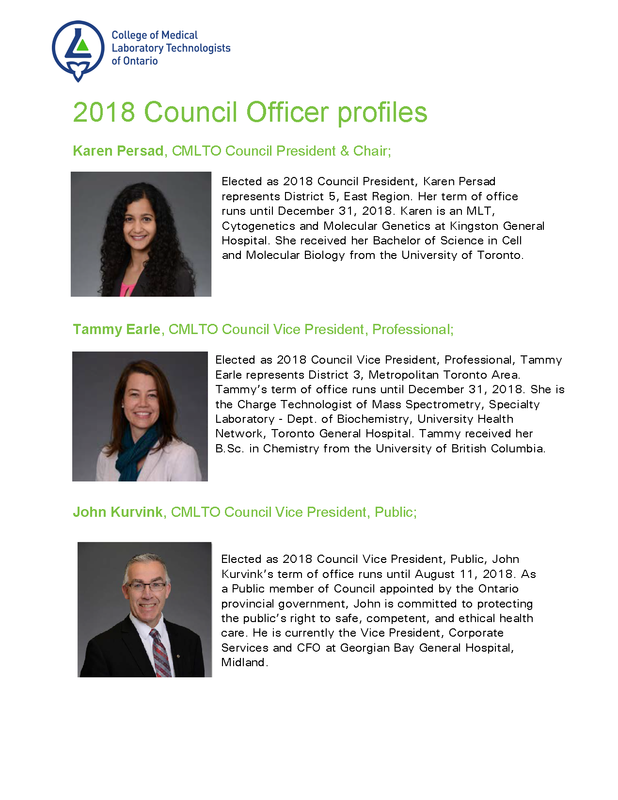 At its November meeting, the CMLTO Council elected its 2018 Council officers: Karen Persad, President; Tammy Earle, Vice President, Professional; John Kurvink, Vice President, Public.